Cross veiled during Passiontide in Lent (Pfarrkirche St. Martin in Tannheim, Baden Württemberg, Germany). Passiontide (in the Christian liturgical year) is a name for the last two weeks of Lent, beginning on the Fifth Sunday of Lent, long celebrated as Passion Sunday, and ending on Holy Saturday. "Passiontide" refers to the last two weeks of Lent. According to Cyril of Scythopolis, during this time the monks of the East, who had chosen the desert for a severer mode of life, returned to their monasteries. In certain countries, such as Brazil and Italy, it is seen as the beginning of the Holy Week observances. The Viernes de Dolores (Friday of Sorrows). is a solemn pious remembrance of the sorrowful Blessed Virgin Mary on the Friday before Palm Sunday held in the fifth week of Lent. In the Orthodox Church, the Fifth Saturday of Great Lent is known as the Saturday of the Akathist, when the "Akathist to the Theotokos" is sung at Compline. In the Roman Catholic Church, Western Rite Orthodoxy, and in Anglo-Catholic churches, all crucifixes and images may be covered in veils (usually violet, the color of vestments in Lent) starting on Passion Sunday: "The practice of covering crosses and images in the church may be observed, if the episcopal conference decides. The crosses are to be covered until the end of the celebration of the Lord's passion on Good Friday. Statues and images are to remain covered until the beginning of the Easter Vigil." (Specifically, those veils are removed during the singing of the Gloria.) The veiling was associated with Passion Sunday's Gospel (John 8:46-59), in which Jesus "hid himself" from the people. In the Tridentine Mass, Psalm 42 (43) is omitted at ferial Masses until Holy Thursday inclusive, as is the short doxology (Gloria Patri) at the Introit and the Psalm Lavabo at Mass. It is likewise omitted in Psalm 94 at Matins, and the responds at Matins, Prime, Terce, Sext, None, and Compline. Also in the ferial Mass, the Preface for Lent gives way to the Preface of the Cross. In the 1955 Holy Week revisions, Passion Sunday was formally renamed from Dominica Passionis or Dominica de Passione ("Sunday of the Passion") to Dominica I Passionis, "First Sunday of the Passion" or "First Sunday of Passiontide". Palm Sunday, formerly Dominica in Palmis ("Sunday in Palms") became Dominica II Passionis seu in Palmis ("II Sunday of the Passion or in Palms"). 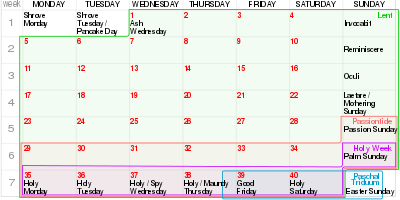 Since the revision of the General Roman Calendar in 1969, the name "Passiontide" is no longer used for the last two weeks of Lent, although the former usage is somewhat preserved in the formal name for the Sunday before Easter, "Palm Sunday of the Lord's Passion". However, the Preface called that of the Passion of the Lord I (The Power of the Cross) is used in the fifth week of Lent and the Preface of the Passion of the Lord II (The Victory of the Passion) is used on Monday, Tuesday and Wednesday of Holy Week. Passiontide is observed in many provinces of the Anglican Communion, for example in the Church of England. In the Common Worship liturgy, material proper to Passiontide is used from Evening Prayer on the Eve of the Fifth Sunday of Lent to the evening of Easter Eve. Such "proper material" includes prefaces to the Eucharistic Prayer, special orders for Morning Prayer and Evening Prayer, and seasonal material for Night Prayer and Prayer During the Day. Although the Sarum Use used crimson as the liturgical colour for the whole of Passiontide, Common Worship recommends continuing in purple (or Lenten array) throughout the fifth week of Lent, changing to red for Holy Week. Much music has been written for Passiontide or rather for the last days of Holy Week. Passion cantatas have been composed to texts in a variety of languages, taking as their theme the hours or days before the Crucifixion of Christ. Many settings have been made of the Latin poem Stabat Mater, which describes Mary standing in front of the Cross watching her son die (the Feast of the Seven Dolours of the Blessed Virgin is observed on Friday in Passion Week), and the lessons from the Tenebrae service have been set by a variety of composers. Several composers have set to music the seven sayings of Jesus on the cross. Heinrich Schütz composed a cantata, Die sieben Worte Jesu Christi am Kreuz, c. 1645. Joseph Haydn wrote seven string quartets, Die sieben letzten Worte unseres Erlösers am Kreuze (The seven last wods of our Redeemer on the cross) which was also appeared in other arrangements. The Seven Last Words from the Cross, a cantata for choir and strings was composed in 1993) by James MacMillan. ^ a b Herbermann, Charles, ed. (1913). "Passiontide" . Catholic Encyclopedia. New York: Robert Appleton Company. This article incorporates text from this source, which is in the public domain. ^ Grupo LEXED. "Viernes de Dolores". Quanaxhuato.com. Wikimedia Commons has media related to Passiontide. This page was last edited on 19 April 2019, at 17:53 (UTC).